I’ve been feeling stressed over my reading. I get this way sometimes. I’m a reader, but I wouldn’t use the word “voracious.” I go through periods of voraciousness, but then I have quieter periods as well. In the writing world, especially, there’s a ton of pressure (and it’s real) to always be reading. I get it. Reading with a critical eye can help improve a writer’s craft—to a certain extent. But writers need to write. They need to write regularly. They need to get comfortable with revising. They need to develop a ruthlessness about their own work. None of these things comes from reading. So while reading is one item in the writer’s toolbox, it’s not the only thing. Nor is it the most important, in my opinion. I know many voracious readers who struggle conveying their thoughts clearly on the page. But it’s also true that I do NOT know any good writers who don’t read at least somewhat regularly. It’s a balancing act, for sure, especially when there are other storytelling mediums (media?) that can serve as teaching tools as well. We’re living in a Golden Age of television (that started with The Sopranos). Writers CAN learn many aspects of craft and storytelling from watching TV, although your snootiest writers would likely say otherwise. I don’t apologize for watching TV. I think visually, so great TV is a great playground for me. I’m pretty much exclusive to Netflix these days. Binging does affect what I’m able to take in and process, so I will binge and then go back after some time and re-watch shows with a critical eye. I’ve done this with The Sopranos, The Wire, Breaking Bad, The West Wing, The Newsroom, Dexter, and probably others I’ve forgotten. I’ll often watch pilot episodes a half dozen times, since pilots (when done well) effectively and efficiently set up the narrative and characters. Anyhow, back to my point. Despite everything I just said above, I still feel self-conscious when I get to the end of the year having read only 10-20 books and some of my colleagues have read 60, 70, even 80 books. I do think I could—and should—read more. I definitely waste a lot of time doing stupid stuff (ruminating is a biggie), so my goal for 2017 is to shift my mindset when I get anxious and ruminating-y and do something else. Not just reading, either. Getting out and about. But definitely reading more. 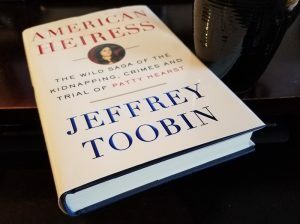 So first up is this book: American Heiress by Jeffery Toobin. It’s for a book club I’ll be crashing later this month. I probably wouldn’t have picked up this book on my own. Going in, I was only mildly interested in Patty Hearst. But the book IS good—and not just because of the sensational story that it was (and still is), but also because it’s providing me with a sense of time in history that I’ve paid little attention to. I was born in 1973, so while I was alive during these events, I obviously don’t remember them…or even have a sense of the time. In terms of the book (I’m about half way through it), my biggest nit so far is Toobin’s vocabulary. He’s obviously a smart guy (regular writer for The New Yorker, after all), and he loves impressive words (which are probably normal words to him, and probably normal for the average New Yorker reader). I have no problem with this. I’ve acknowledged over the years that I have a weak vocabulary. No shame in that, since I’m aware and am constantly trying to improve. I’m friendly with my online and paper dictionary and love learning new words. That said, certain words should be used only once in a book (e.g. whipsawed, peripatetic, perfidy—several of these are used within a few pages, and even a few paragraphs, of their first mention). All are great words, but let’s mix it up a bit. I don’t blame Toobin as much I blame his editor. A good editor should save a writer from himself or herself. I suspect Toobin wrote most of these words. But the editor should have flagged the second and third mentions, especially when such great synonyms exist. For example, perfidy and treachery. They mean the same thing, and they’re both good words. After this book, I might read The Brief Wondrous Life of Oscar Wao by Junot Díaz. It’s been sitting on my shelf forever.